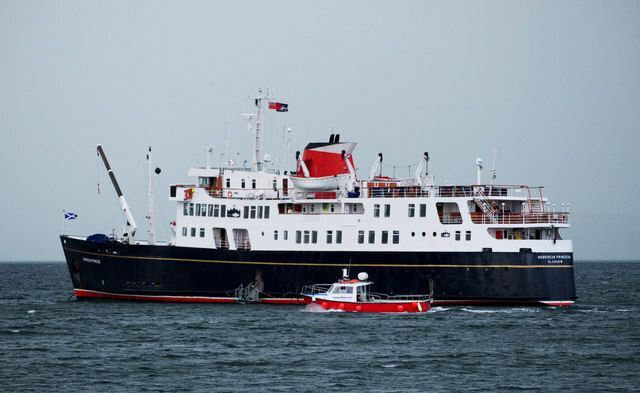 The 'Hebridean Princess', a small luxury cruise ship which accommodates only 50 guests and 38 staff, at anchor in Bangor Bay. The ship anchored here while on a "Gaelic Trilogy" cruise around the west coast of Scotland, Northern Ireland and the Isle of Man. See Link for more information. Unable to fit into the harbour at Bangor, passengers were transferred ashore on the ship's own tender. In an earlier life, the ship operated as a car ferry. She was launched as the MV 'Columba' and was the last of three car ferries built in 1964 by Hall, Russell & Company, Aberdeen. The Columba mainly operated out of Oban, carrying up to 600 passengers and 50 cars between the Scottish islands. See also Link for related images. The small red and white boat passing in front is current 'Bangor Boat' Link the 'Ocean Crest' Link . Caledonian MacBrayne Limited (CalMac) was formed in 1973 following the merger of the Caledonian Steam Packet Limited and David MacBrayne Limited. Ownership passed to the Secretary of State for Scotland in 1990 and is now vested with the Scottish Government. This Shared Description covers any vessels owned or operated by CalMac since 1973. It may also include any vessels in service with other owners or operators after disposal by CalMac.